Since 1988, Central Florida Wholesale has been one of the top retailers in Marion County and the surrounding Central Florida area for all types of general use tools and related accessories. Whether you visit our 5,000 square foot store in Belleview or our huge location at Market of Marion, you’ll find the right tools and tool accessories you need at unbeatable lower prices. 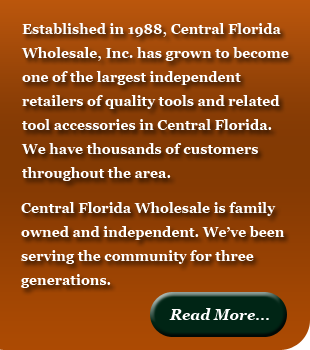 Central Florida Wholesale is family owned and 100% independent. We purchase our tool inventory directly from the suppliers and cut out the coop middleman. This allows us to buy for less money and pass along substantial savings to our customers. 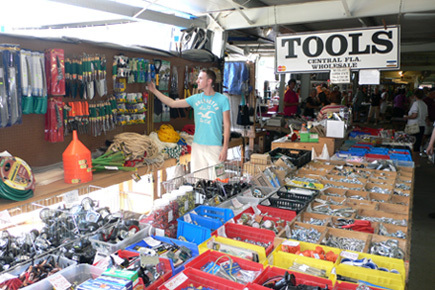 You won’t find lower prices anywhere on all types of tools.